I've been stitching more feather stitches on the Brown bell pull. I really need to come up with a name for this project rather than just referring to it by the main color! For this variation, on the feather stitch, I lengthened some of the "feathers" and added some little woven spider-web flowers in a variegated pearl cotton. This was a feather stitch variation that I don't believe I have ever attempted before. It did take me a couple of tries to get it worked out. It has a great graphic quality to it. This one is a variation of the maidenhair feather stitch that I did with Valerie's Joyful Embellishments challenge. More leaves and some little bead flowers at the ends of the stems. 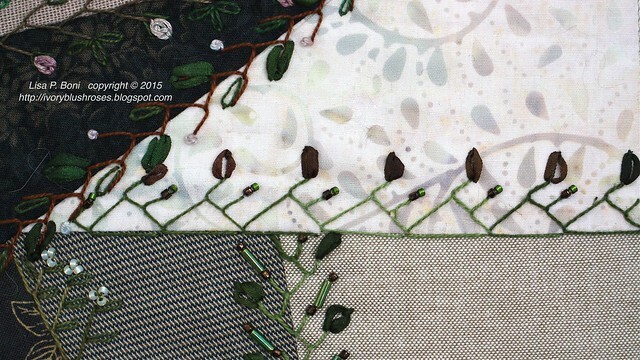 This looks like a pretty plain feather stitch, dressed up with buttons, beads and some SRE leaves. But it actually was one of the more difficult feather stitches as it joggles back and forth the opposite of how feather stitch is usually done. To my eyes, it ended up looking like a messy feather stitch. I think it would have turned out better if the stitches had been smaller and the angles as little greater, but I knew I wanted to use some small mother of pearl buttons with this and this was the scale that worked best. This was another curvy feather stitch, but this time with bullion stitch flowers, french knots and SRE leaves. It is one of my favorite seams so far... I think it's the addition of the bullion's! So the bell pull is about 1/3 completed. I'm working my way across and hunting for seam ideas as I go that complements what is already there, but taking care not to duplicate any seams. I'm loving how it is turning out. As is so often the case, the photographs don't do justice to how lovely this piece is looking! I'm beginning to wish that I had done my CQJP blocks in these colors as I am really loving the combination of brown/taupe fabrics with the green stitching on them! WOW! 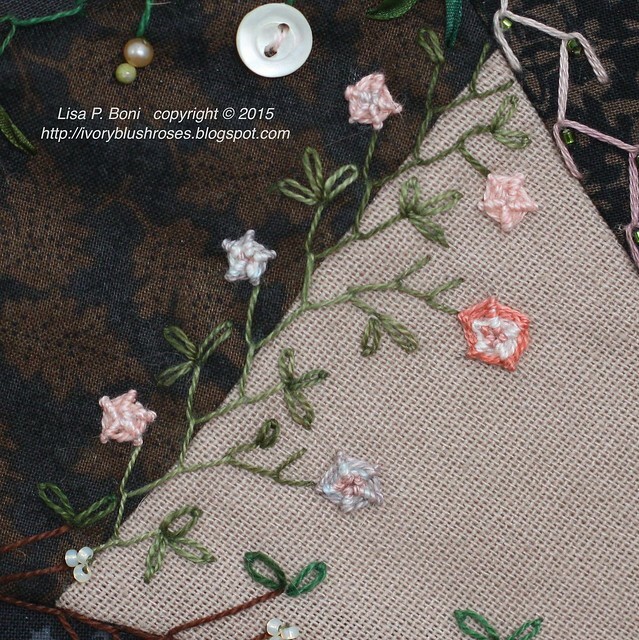 Great variations of a stitch I need to practice with. I love the curvy one too and your different flowers. Exquisite work once again. 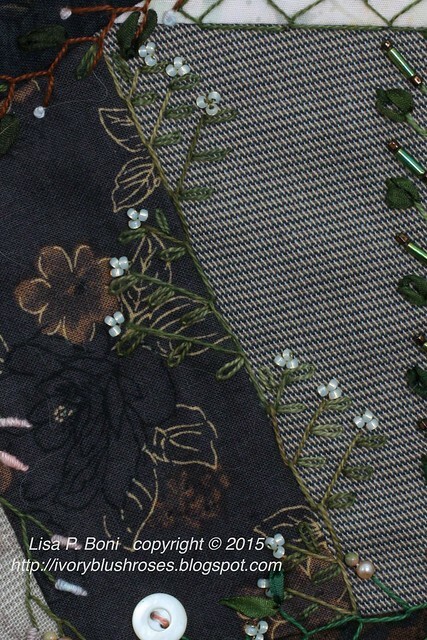 Oh, such beautiful seam embroidery!